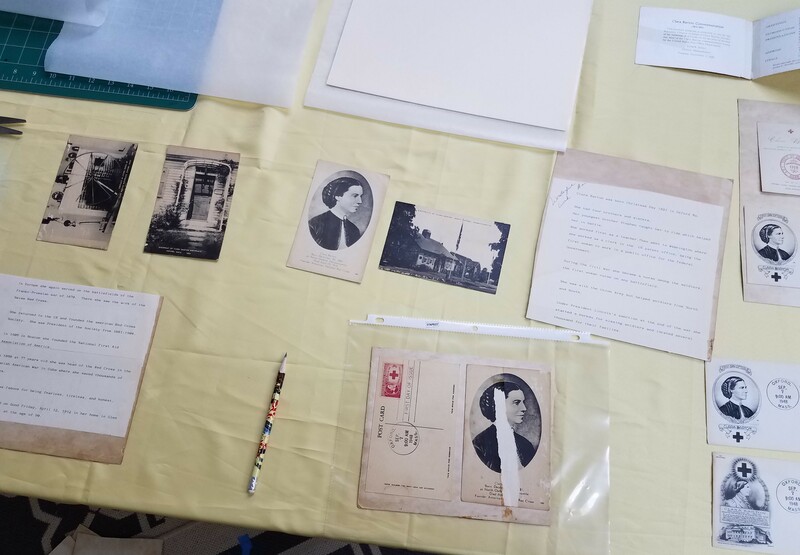 Before I start, I want to direct you to Kim’s blog post from last summer where she gives an excellent overview of the work archivists do when they process an artist’s collection- a good introduction to the work I am doing here. 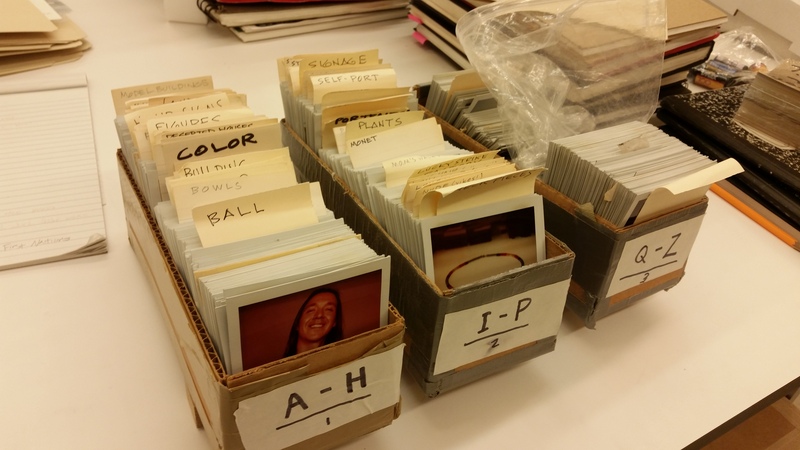 Polaroid Works; undated; Kimowan (Metchwais) McLain Collection, Box 1 Folder 16, National Museum of the American Indian Archive Center, Smithsonian Institution. Two silhouettes, the one on the left a familiar sight to my colleagues and friends at home in Chapel Hill, the one on the right an everyday sight for my current colleagues and friends here in DC. 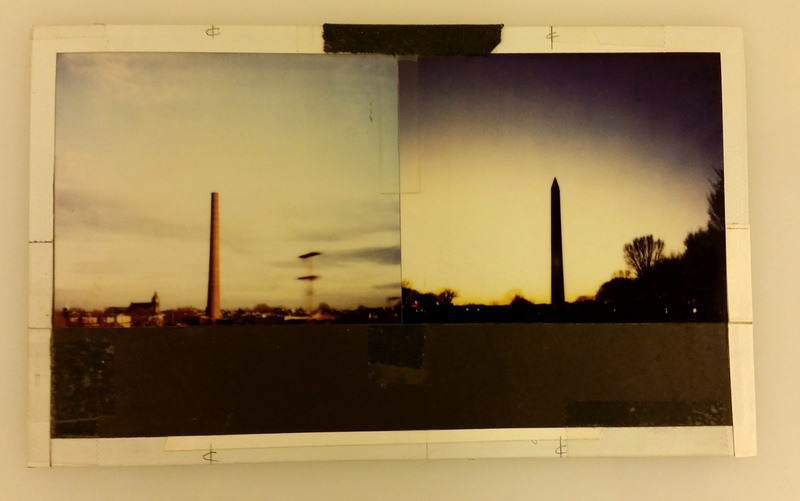 The Lucky Strike factory tower in Durham, NC and the Washington Monument on the National Mall, photographed by Kimowan (Metchewais) McLain, the artist whose archive I am working on this summer at the Smithsonian National Museum of the American Indian Archive Center. These two Polaroids, taped together and masked with black construction paper by the artist, are an introduction to a recurring theme in Kimowan’s archive, a motif I want to play off of and trace throughout the collection as way to highlight the unique beauty and challenges found in an artist’s archives . A brief introduction to Kimowan, a significant figure in contemporary Native art: First Nations Cree born in 1963, he spent most of his childhood and early adulthood on the Cold Lake First Nations reservation in Alberta. His art career began as an illustrator, cartoonist and later editor for the magazine Windspeaker. At age 29, he was diagnosed with a rare type of brain tumor (oligodendroglioma) and given a life expectancy of 10 to 11 years. He went on to complete his B.F.A. at the University of Alberta in 1996, and his M.F.A. 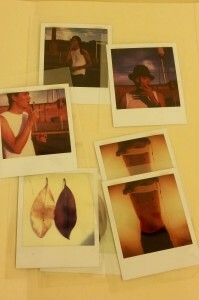 at the University of New Mexico in 1999. He then moved to Chapel Hill, North Carolina where he continued his career as an artist and also became a professor of Studio Art in the Art Department, UNC-Chapel Hill. While in Chapel Hill, he had solo exhibitions and participated in group exhibitions, including the well-received Loom (2005). He passed away in 2011 at age 47 when the cancer returned. His wish was that his works and studio archives be gifted to the NMAI and they arrived here in 2015. Lucky Strike/Durham, c. 2001, Kimowan McLain, mixed media. National Museum of the American Indian, Smithsonian Institution. 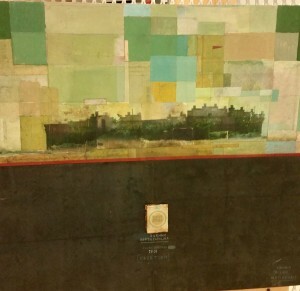 Lucky Strike/Green, c. 2001, Kimowan McLain, mixed media. National Museum of the American Indian, Smithsonian Institution. “I’ve had the strangest reaction to this news. It has restored my fear – shaken my usual defense against my own smoking. […]There is a demon inside our bellies that eats smoke and steals life. God, what a beautiful creature it is. […]How black are my lungs? 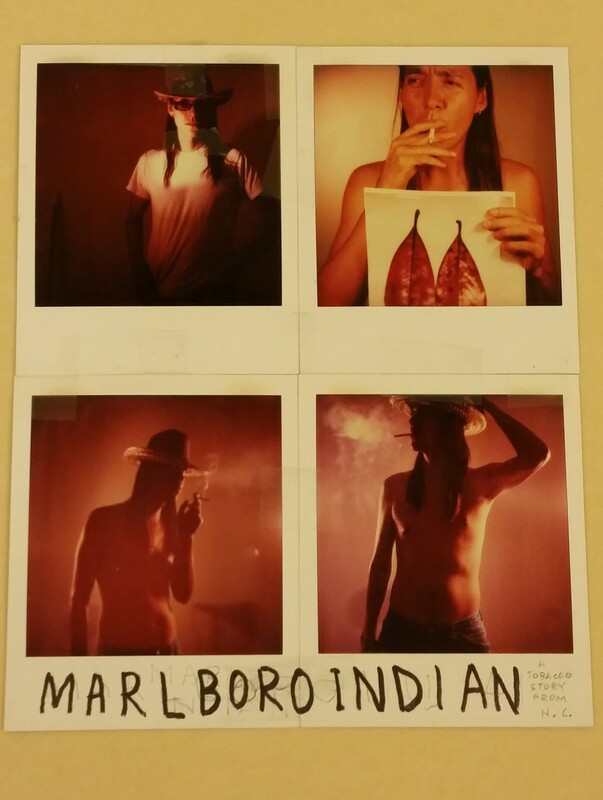 […] They were so defiant, they laughed at death; but they, like the Marlboro Man, will die too. Perhaps I will smoke in their honor. Cigarettes can be my death song, and I will laugh, fearlessly, as I sing. Then again, this could be just another item for my list (TOP TEN WAYS TO JUSTIFY MY SELF-DESTRUCTION). Shh. Not so loud. Black Sketchbook; 2000-2001; Kimowan (Metchewais) McLain Collection, Box 21, National Museum of the American Indian Archive Center, Smithsonian Institution. Polaroid Works; undated; Kimowan (Metchewais) McLain Collection, Box 1 Folder 13, National Museum of the American Indian, Smithsonian Institution. Lucky Strike Factory; undated; Kimowan (Metchewais) McLain Collection; Box 7 Folder 18; National Museum of the American Indian, Smithsonian Institution. You can see the specific leaves he decided on as lungs, the choice he made not to include any of the images of himself in front of the actual factory, his decision to capture the process of removing his shirt (the camera trigger visible in his right hand) for the Marlboro Indian series. These Polaroids were an integral part of his artistic practice, and lived, neatly arranged alphabetically in these handmade boxes, until I rehoused them into Mylar sleeves and acid-free folders. How will I indicate this original housing in the finding aid? There are many other questions. One of the trickiest, thorniest problems comes from Kimowan’s place as an artist working in both analog and digital mediums. 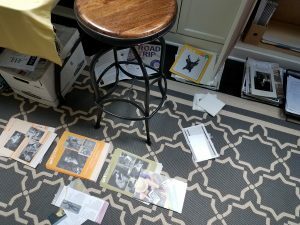 He had a carefully curated web presence: a YouTube channel, a Twitter account, and website featuring images and blog entries, to name a few. Of these, only the YouTube channel and Twitter account are currently accessible. His electronic records, presumably the blog posts, the website, and more, are currently housed on an external hard drive the Archives and I are having trouble accessing. I know Kimowan wrote extensively and very personally in his blog, and it is frustrating to have that (large) piece of the story missing right now. However, the story we do have is a compelling one. 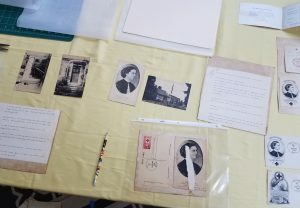 As art historians, Kim notes in her post, it is easy for us to see the many exhibits and research projects this material offers, and as archivists to see the value in making these accessible. The story behind the Lucky Strike images is only one of many in the collection; his turbulent, bitter relationship with his step-father (resulting in the installation piece Reburial: Wrathful Architecture), the inspiration he found in travel and in other’s works, the beginnings of his magnum opus Cold Lake, these are only some of the threads here in the materials, waiting to be teased out and added to the tapestry of his oeuvre. Working with this collection has brought into focus for me the real urgency behind the work we are doing with the Learning From Artists’ Archives initiative. The workshop discussions and interactions with artists have taught me that many artists are actively thinking about their legacy. There are institutions like the NMAI who are interested in collecting the archives of these contemporary artists. How then can the complexities of material, content, and intention found in a studio archive be effectively transferred from the artist to the institution ? That’s the question, the one we have been working on since the beginning of this project, thinking through in these blog posts, and the one we will continue to explore together at our upcoming workshop, symposium, and for many of us fellows, beyond that into our professional careers. 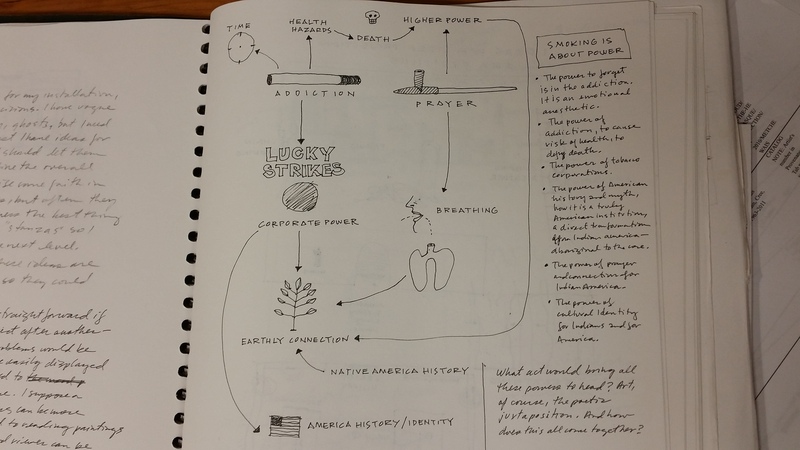 I hope this peek into one artist’s archives has served to emphasize the importance of this work, for all of us. As we wrap up the school year, I wanted to update you all on our experiences at the various professional conferences we have been presenting at throughout the year; while also exploring the topic of the wider impact we see this project having. I also want to point out some important dates on the horizon and let you know what to expect from the summer blog posts. 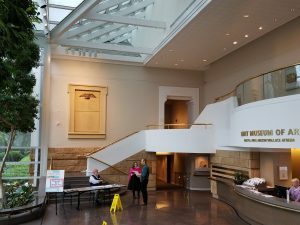 The Art Libraries Society of North America Southeast Chapter (ARLIS/SE) held their annual conference this past November in Atlanta Georgia. Elizabeth, Erin, and I attended and gave a presentation on the Learning from Artists’ Archives initiative. 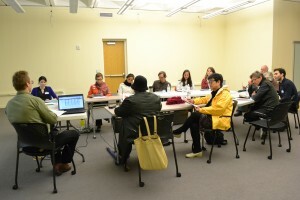 We gave an overview of the entire project but we focused mainly on the first workshop. We received a very positive response and the audience was full of questions, both logistical/practical and theoretical. 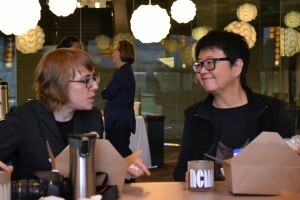 In March, Kim and JJ attended the annual ARLIS and VRA joint national conference. 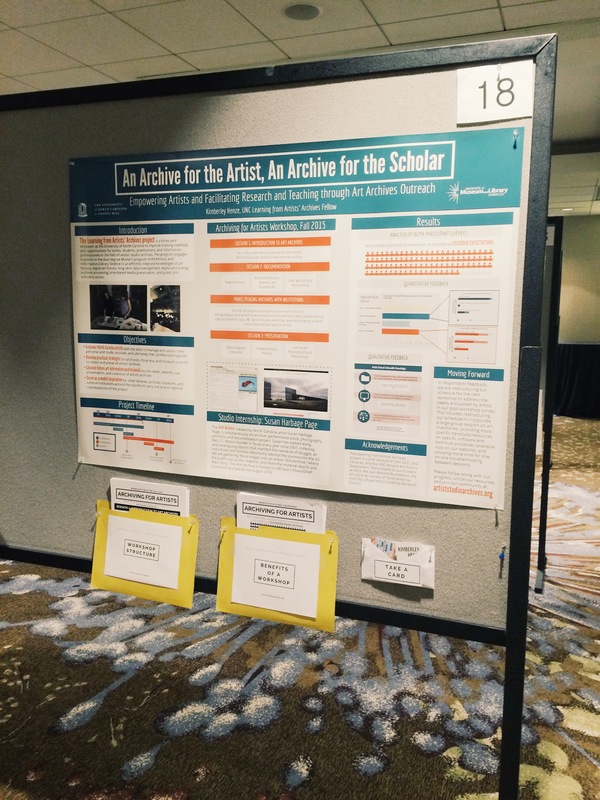 Kim gave a poster presentation focused on empowering artists and outreach through artists’ archives. She also received positive responses, and several people told her how helpful they had found the workbook to be. Also in March, Elizabeth presented a little closer to home at the LAUNCH-CH conference here in Chapel Hill. 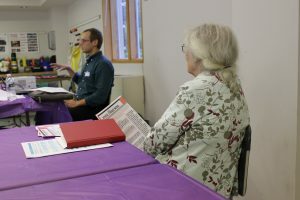 Speaking to a more general audience of librarians, she enjoyed the challenge of tailoring her presentation to an audience largely unfamiliar with initiatives of this type. Most recently Elizabeth and I presented at the Society of North Carolina Archivists/ South Carolina Archivists (SNCA) annual conference as part of a panel focused on archives- community outreach and engagement (moderated by our own Denise Anthony!). Next on the agenda is Colin at the Personal Digital Archiving conference in Ann Arbor, coming up this week. He will be focusing on the digital preservation and storage sessions of the workshop. For the fall, Fannie is going to present on best practices for archiving fiber art at the Textile Society of America Symposium in Savannah, GA. Carol, JJ, and Erin are also planning a panel for the College Arts Association Conference, February 2017 in New York. We will keep the PUBLIC EVENTS page on this site updated, so keep an eye out for a presentation near you. 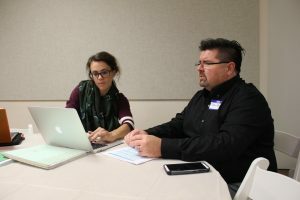 Archives as an outreach endeavor and how it was impacting the local artist community, really gave us a chance to come up with creative solutions and innovative ideas for the upcoming workshop. We have also been so excited to get such positive responses at our presentations – archivists volunteering themselves to be part of the workshop lunch panel, art librarians considering similar initiatives for their institutions, and most notably hearing people’s reactions to the workbook. One archivist from SNCA was thrilled to be able to tell us in person how helpful the workbook had been to her son as he moved his studio across the country and began to build a studio archive. Don’t forget the workbook is available for download here on the site. This summer, the four first years will be interning at various institutions and keeping everyone informed on our work via posts on this blog. Look forward to Elizabeth’s post soon from the Georgia O’Keefe Research Center in Santa Fe, NM. Next month, Fannie will be updating from the Fales Library and Special Collections at New York University. Erin and I will both be in D.C. at the Smithsonian, Erin will be interning at the Archives of American Art, and I will be in the archives of the National Museum of the American Indian. We are all looking forward to these exciting opportunities and to sharing with you what we are learning. Keep in mind these upcoming dates- October 8th for the second ASA workshop at the Mint Museum Randolph Center in Charlotte, NC. Registration for this will open mid-June. 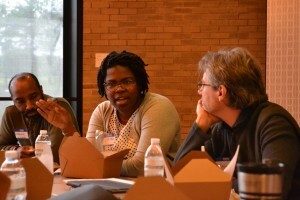 Also, March 11th for the un-conference at Wilson Library UNC, in Chapel Hill. More information to follow on both of these events, so stay tuned, and we look forward to seeing you! Reviewing the workshop as a team, we have begun the discussion of what worked well, what didn’t, and what all of this means for next year’s workshop. Before the artists left the NCMA we asked them to fill out a quick survey on how they felt the day went. Their feedback provides much helpful insight. Several artists observe that participating in the workshop positively impacts their self-image – one artist is pleased to find “Wow, people in the field really care about my work” and another feels the workshop “may be the most important event I have attended as an artist.” In analyzing the recorded responses, Erin and Colin find that 96% of participants feel that the workshop as a whole “exceeded expectations.” In the responses and in personal interactions, the artists are overwhelmingly positive about the experience and many express thanks for all of the hard work that went into making this day happen. Gratifying and encouraging news for the team to hear, particularly as we begin to plan the next workshop. As requested, many artists also provided constructive criticism which we hope will lead to improvements for next year. 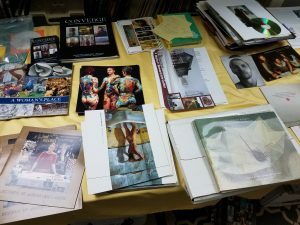 Several participants noted the diverse range of artists present at the workshop: Elizabeth and Erin have introduced some of the artists in previous posts – we have painters, sculptors, photographers, mixed media and fiber artists, and all at different stages in their artistic careers – from just starting out to well-established. Diversity is a stated project goal and something key to its success. It also means we have a wide range in the technological comfort-level of the participants which proves challenging, particularly in the breakout sessions focused on areas where (as Kim noted) we cannot offer standardized best practices, simply because they do not yet exist. For example, one young artist I talked with had first heard about the workshop through Twitter (#artiststudioarchives) and attended the “Web and Social Media” session led by Kim to learn how to manage her online presence – to define the fuzzy line between her professional/artist persona and her personal life, a truly complex and perplexing issue we all face. 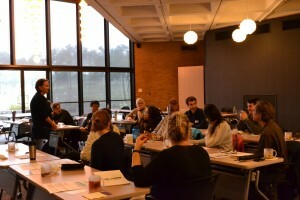 Another stated goal of the Learning from Artist’s archives project is the hope that it can serve as a model for other institutions to follow. To that end, many of us will present numerous aspects of the project at various professional conferences. 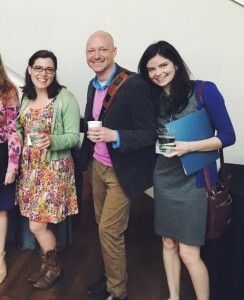 In fact, this weekend, three of the first year fellows – Elizabeth, Erin, and I, are excited to present the first ASA workshop at the ARLIS/SE chapter conference in Atlanta. 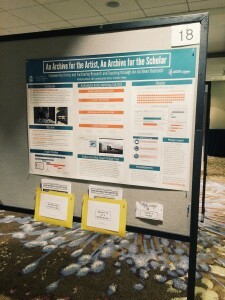 Kim and Heather hope to present at the annual ARLIS/NA conference (Kim with a poster presentation, Heather with a panel) in Seattle this coming March. Meanwhile Colin is considering presenting his current work with Cornelio Campos at the Personal Digital Archiving conference, Ann Arbor in May. (Keep an eye out for his next blog post on this same topic!) We will post in the Public Presentations section of this site as schedules are confirmed. Please also note that many of the handouts from the ASA workshop are now available in “Resources.” The Workbook effort also continues, stay tuned for updates!